What is the most important question you can ask yourself right now? 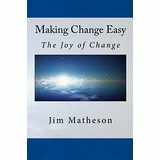 Could reading my book Making Change Easy change your life? Does life have to be so hard? Is there a way to make change easier? Is there a way to be happy all the time? Attention Editors, Publishers, Marketers, Bloggers and Webmasters! You can republish your favorite articles from our web site: Click here for details.